Delicious and refreshing strawberry lemonade. This recipe is awesome for summer gatherings! Fresh strawberry lemonade bursting with fresh fruit flavor. 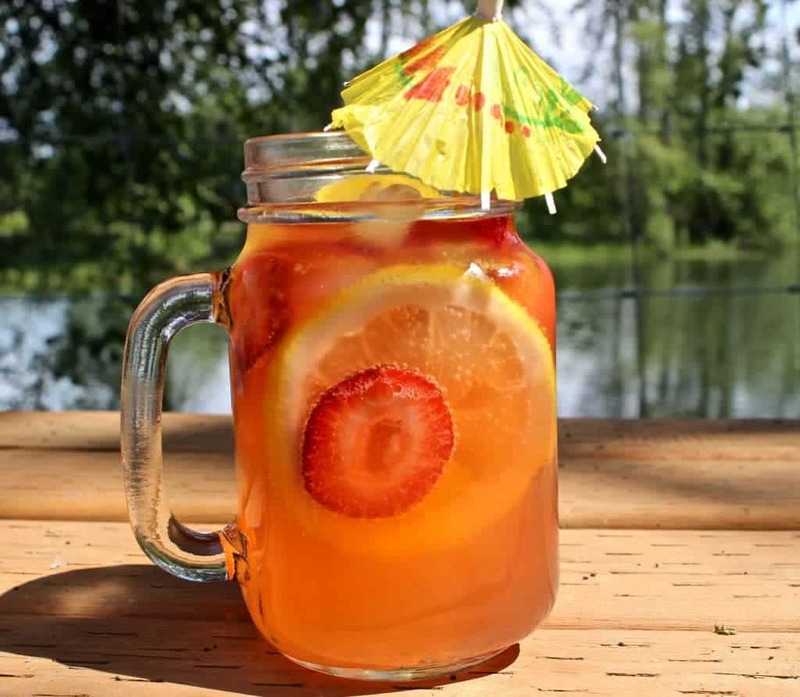 This is an awesome summer drink recipe, guaranteed to please at any gathering. I’m a strawberry fanatic. I used to be allergic to strawberries when I was a kid. I would break out in terrible rashes and end up with a mild upset stomach. Thankfully I have outgrown my strawberry allergy and I have since then become quite the addict! I guess it’s because you always want what you can’t have! now that I can have them, I eat them by the bucketloads. We have a glorious strawberry patch in our yard that I absolutely love! last year we made strawberry pie, angel food cake, strawberry crisps. You name it we made it with strawberries. If you read the first part of this post you will understand my heated emotions that I am going to describe here. I was walking in my yard last week with my husband and my cute little baby girl. I looked over to my right and I see our dog had jumped right into the strawberry patch. This would be upsetting all in itself, but what she did next was horrifying and slightly TMI. She “relieved” herself directly on top of my strawberry plants! and I don’t mean the liquid kind of relief if you catch my drift. I was horrified. I just stared at her while my husband quickly got her back out of the garden fence. Needless to say, I’m a bit turned off by my beautiful strawberry patch. For this post I went and bought strawberries from the store since mine aren’t ripe yet (I still haven’t forgiven my dog.) Anyway, despite all of my strawberry drama I still find them delectable. I really love cold drinks in the summertime so I figured strawberry lemonade would be just the thing! I love this recipe. It turned out so yummy! Making a syrup for the strawberry lemonade. Cut the strawberries into small pieces, place into a medium sized saucepan with 5 lemon slices. Stir the ingredients over medium heat for 10 minutes or until they are reduced to a syrupy sauce. Strain the contents over a medium sized bowl using a wire mesh strainer. Add the syrup from the bowl into a pitcher. Next, add the lemonade into the pitcher. Add in any leftover strawberries and lemon slices to give the pitcher a decorative look. I also added in ice cubes to cool the drink quickly. Strawberry lemonade looks delicious, thanks for sharing with Hearth and soul blog hop. pinning, tweeting and sharing in google plus. This is a great summer drink. Thanks so much Swathi!